As your County Councillor, Mayor, and now Senator I have been a strong political voice for Cork the last decade. Investment in our communities and public services is essential and some of my priority local issues include a new hospital for Cork, sufficient long-term housing infrastructure and rural broadband connectivity. Over €40,000 has been allocated to 23 projects in Cork County to tackle the scourge of illegal dumping following work by Cork-based Fine Gael Senator, Tim Lombard. Senator Lombard said: “Illegal dumping is a massive blight on our communities. It shows a complete lack of respect for other people and for the environment. “Fine Gael’s priority, with this recent funding increase, is to build on the progress we have made in protecting our natural environment to ensure we preserve it for future generations. Speaking at the launch of the 2018 Anti-Dumping Initiative Minister for Rural and Community Development, Michael Ring T.D said: “As the Minister responsible for rural development, I am acutely conscious of the threat that illegal dumping poses to jobs, incomes and investment on those areas of our country whose growth is dependent on the preservation and protection of our magnificent landscapes, and our clean waterways. “Community groups that engage in local clean-ups, motivated purely by a love of place and pride in parish, have been the bulwark against those who engage in this deplorable practice. Cork Senator, Tim Lombard, has said there will be significant improvements to pension outcomes for homemakers and carers who were affected by rate band changes in 2012. The new Total Contributions Approach will calculate pensions based on all contributions made over a working career. There will also be provision for a new Home Caring Credit of up to 20 years to assist workers who took time out to raise families. The new system will be implemented from the 30th of March, and payments to eligible pensioners will be backdated to this time. Senator Lombard said: “In recent months, many people expressed concern to me about their pension rates, which were affected by rate band changes in 2012. “I have been in constant communication with my Fine Gael colleague, Minister for Employment Affairs and Social Protection, Regina Doherty on this issue, highlighting the concerns of Irish pensioners. “Minister Doherty has been working with her Government colleagues to find a solution to this issue and today, the Government has agreed to allow post 2012 pensioners to choose between their current rate and that to be introduced under the Total Contributions Approach. Senator Lombard continued: “Later this year the Department will invite over 40,000 pensioners, currently assessed under the 2012 rate band changes, to have their pensions recalculated under TCA to determine if they qualify for a higher rate of entitlement. “As it will take time to design and set up administrative processes, and the necessary IT systems, the Department expects to send out the invitations from Q4 2018. “Pensioners do not need to contact the Department or do anything else until written to by the Department nearer the end of the year. The first payments will be made from early 2019, with payment backdated to the 30th March 2018. “The TCA will ensure that the totality of a person’s social insurance contributions – as opposed to the timing of them – determines a final pension outcome. “No existing pensioner will see their pension reduced by this change- if their rate is improved by the TCA calculation option they will benefit, but if their TCA calculation entitlement is lower, they will remain on their existing rate. A new ferry route between Ringaskiddy and Santander in Northern Spain can link the Wild Atlantic Way with the Camino, a Fine Gael Senator has said. Senator Tim Lombard says the new ferry sailing represents a great opportunity to link the two iconic routes. Senator Lombard said: “I am delighted to see Cork linked to Northern Spain by a sea route. There are deep historical ties between the two places and I hope to see them renewed by the new ferry service. “The north of Spain has much to offer visitors as indeed does Cork. I believe the new service is a great opportunity to link up two iconic tourist trails, the Camino de Santiago and the Wild Atlantic Way. “The trek to Santiago in Gallicia, Northern Spain, traditionally begins when the traveller sets out from their own home. “This has led to routes to Santiago springing up in Germany and France, known as Jakobsweg and Le Chemin De St. Jacques respectively. “I propose to incorporate the Wild Atlantic Way into an Irish Camino, beginning by touring the breath-taking scenery of the South West of Ireland and then sailing to Santander and before concluding in Santiago de Compostela. “I think that uniting the two iconic routes will boost the profile of both and further strengthen the bonds of friendship between our two countries and offers endless possibilities in terms of boosting tourism. “I am looking forward to welcoming the Spanish back to Kinsale personally this Spring,” the Cork Senator said. Job creation in Cork is up by 6% in the last year – an increase of 1,372 jobs throughout the county. “This is excellent news for all of us here in Cork, and is consistent with the strong employment performance across the economy. “I am very pleased to see this strong level of job creation delivered by Government-backed companies; the employment boost from Enterprise Ireland backed companies shows the Regional Action Plans for Jobs is delivering for Cork. “Fine Gael’s priority is to support companies across the entire country to continue to build on a strong national job creation performance. We are committed to strengthening our communities through employment creation, and building a sustainable future for all our citizens. “Over 19,000 jobs were created across Ireland by companies supported by Enterprise Ireland in 2017, with every county seeing job increases. We have seen particularly strong jobs growth in the Construction, Engineering, Lifesciences, Digital Technology, Electronics, Food and ICT sectors across the country. A massive increase in applications for the free personalised alarms for people over 65 has resulted in additional funding for the Senior Alert Scheme. Cork Senator, Tim Lombard, said: “The objective of the Seniors Alert Scheme is to encourage community support for vulnerable older people in our communities by providing personal, monitored alarms to enable older persons to continue to live securely in their homes with confidence, independence and peace of mind. “In October last year Minister for Rural and Community Development, Michael Ring, allocated €2.3 million for the Seniors Alert Scheme, widened the eligibility criteria, and launched a nationwide publicity campaign. “The rate of applications for personal alarms quadrupled in November, leading the Minister to now allocate an additional €400,000. Senator Lombard continued: “It is very positive to see such high uptake for this scheme. An additional 268 Cork seniors were approved for the Scheme in November last year, bring the total approved applicants to 2,464, demonstrating this Government’s commitment to the safety of older people in our local communities. “We need to make sure that as many of our older people avail of this scheme as possible, which is why I want am encouraging everyone reading this to get the word out. “All you have to do is make contact with your local Seniors Alert group; there are many around the county, and you can find out about your local group by logging on to www.pobal.ie or phoning 01 511-7222. “This measure exists with the support of local voluntary groups and if users feel in danger or require immediate assistance they can activate the device which will alert designated members of their community who can then assist them. “The community groups that are supporting its delivery are providing a valuable service and deserve great credit. Yesterday morning (Monday) Fine Gael Senator, Tim Lombard, opened his new constituency office in Kinsale. “I am very excited about this new venture. I feel it is very important that people in and around Kinsale have access to an Oireachtas member because this community, which is very much the beating heart of Cork tourism, should be well represented in Dublin. “I will host an official opening early in the New Year, but as of next week my new office, at 71 Lower O’Connell Street, will be open 9am–5pm Monday to Friday. A national allocation of €812,000 has been earmarked for Irish agricultural shows in 2018, €112,000 of which has been granted to Cork. Senator Lombard said: “Agricultural shows are hugely important to our rural economy. We know the economic benefit they bring to the local economy here in Cork, with surrounding towns and villages benefitting hugely from each show. “The Government considers this funding an important investment in rural communities and I am delighted that my colleague Minister Ring has provided this funding. Minister for Rural and Community Development, Michael Ring TD said: “This represents a substantial investment in rural communities and in the rural economy by the Government. I know that this funding will provide a huge boost to the agricultural shows that are such an integral part of our rural culture. This investment is being carried out in coordination with the Irish Shows Association and the recipients are all members of that Association. Additional shows affiliated to the Irish Shows Association may be added to the list at a later stage. Senator Tim Lombard has voiced his intention to declare for the Cork South West Fine Gael convention. 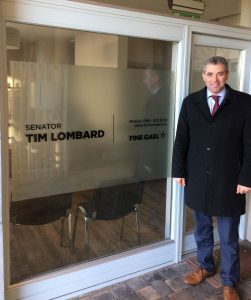 Senator Lombard said: “The current precarious political situation has emphasised the need for clarity regarding Fine Gael candidates for the next general election, whether that will be this year, next year, or 2021. “I have previously indicated but am now declaring my intention to put my name forward to contest the Fine Gael convention for the Dáil Éireann in Cork South West. “As a former Mayor of Cork County Council, and having served 13 years as a local councillor, I have spent more than a decade working directly with the people of Cork to improve and support the quality of life for our local communities. “In 2016 I was elected as a member of the 25th Seanad, and have used my time as an Oireachtas member to present to Dublin the concerns of people all the way down here in Cork. 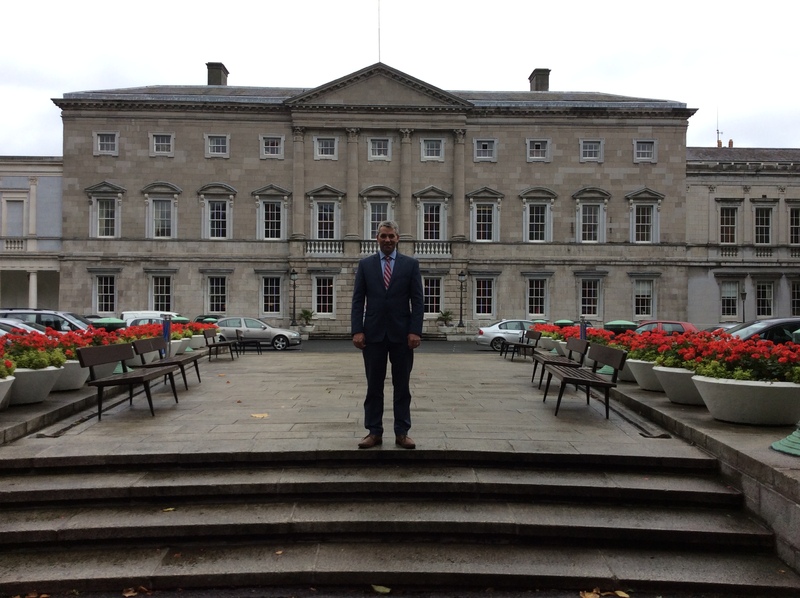 Senator Lombard concluded by stated his belief that his convention candidacy will ensure that Fine Gael can secure two Dáil seats in the impending general election. €215,000 has been invested in replacing the aging water mains that have been supplying Sherkin island. “The 1km section of main being replaced has burst eight times over the past year, leading to significant supply disruptions and outages on far too many occasions.